Matilda W. Bruce coin collection inventory, circa 1900, Archives, American Numismatic Society. 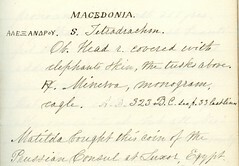 Notebook containing an inventory, or catalog, of Matilda W. Bruce’s ancient coin collection. All coin descriptions are hand written and provide physical descriptions and some historical data of the personages appearing on the coins. From the note on page 31, it would appear that someone other than the collector herself wrote the notebook: “Matilda bought this coin of the Prussian Consul at Luxor…” Although not noted, the book appears to date to the late 19th or early 20th century. Coins were donated to the ANS from Bruce's estate in 1908 and 1909.